Our journey through the North Fork and South Fork country will lead us through the top most headwaters of the Pit River drainage. 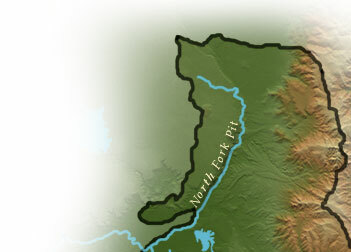 Numerous creeks drain westward from the crest of the Warner Mountain ranges, each with its own unique sub-watershed. Additional flow comes from drier, sagebrush steppe table lands that lie to the west of both forks. Wilderness at the crest gives way to rangeland and then to the intensively cultivated valleys. A substantial reach of the South Fork was converted to canals decades ago. Today, along with this scenic beauty and agricultural productivity is a full range of resource management questions. Knowledge of the variety found in these tributary drainages, and the benefits that arise form the existing agricultural infrastructure, is the first step in the process of making informed management decisions. Your journey will continue by exploring any of the interactive 360 degree panorama views on the map. To experience the exciting multimedia panoramas, video and audio-visual stories, you'll need the QuickTime player. Please see the Plug-In Information.